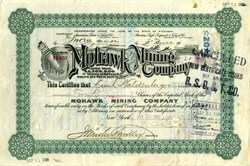 Beautiful certificate from the Mohawk Mining Company - Michigan issued in 1907. This historic document and has an ornate border around it with a vignette of indian arrows. This item has the signatures of the Company's officers. The Mohawk Mining Company was a major copper mining company, based in the Keweenaw Peninsula of Michigan, that was established in November 1898 and lasted until 1932. The company, between 1906 and 1932, paid out more than $15 million in shareholder dividends. The Mine is best known for the large amounts of mohawkite that were found on the property. The Mohawk mine operated until 1932; in 1934 it was purchased by the Copper Range Company.